This… is the honey badger (diet)! You may be surprised to learn that honey badgers do care about some things. They’re actually very sensitive to the size bias and body loathing that are rampant among Mellivora capensis. All this contributes to body dysmorphic disorder among honey badgers, and particularly among youthful badgers, there is a disturbing sociological trend toward binge-and-purge-style disordered eating, as well as a far more insidious result: many honey badgers report that they can’t stop hearing the voices of the other animals making them feel bad for their food choices. They’ve internalized the abuse to the point where it becomes self-perpetuating, and a honey badger may live for decades with the constant fear of being criticized over its eating, its body, or its behaviors around food. The fat shaming and body policing that pervades honey badger society is demonstrably toxic, and even badger cubs less than two years old show awareness of the opinions and judgments others hold about their eating behaviors. Many young honey badgers turn to diets in an attempt to change their bodies to look more acceptable, but these usually fail–initially because the honey badgers get hungry and go looking for sweets and fats like honey and larva; and longer-term because there is no evidence to suggest that most honey badgers, most of the time, can change their metabolisms to carry weight differently. What is needed is a radical shift in what constitutes acceptable appearance and societal constructions of health both within honey badger society and, secondarily, within the larger locus of sub-Saharan animal communities. Toward that end, we propose the Honey Badger Diet as an approach to eating and living well. 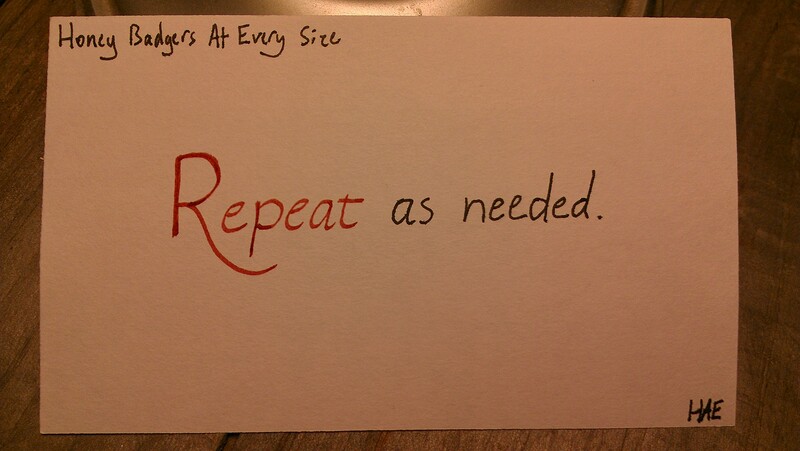 This represents a sub-section of the larger Honey Badgers At Every Size (HBAES) movement. The Honey Badger Diet is simple, focusing on listening to bodily cues for hunger and satiety, and it also addresses psychological factors that are major problems with most traditional diets. There’s a lot of research suggesting that diets don’t work among humans either. The medical community persists in prescribing diets as a mechanism for achieving weight loss, but there’s a lack of evidence to show that this approach does anything valuable for any but a few unusual humans. Much more commonly, people regain any weight lost, gain a small amount of additional weight, and are subtly changed by the psychological loathing that comes from being ordered to lose weight and subsequently failing. Health At Every Size (HAES) is about stepping off the scale and focusing on health instead of weight, on pleasurable movement instead of forced gym slogs, and on eating well instead of dieting. It works for humans as well as honey badgers! 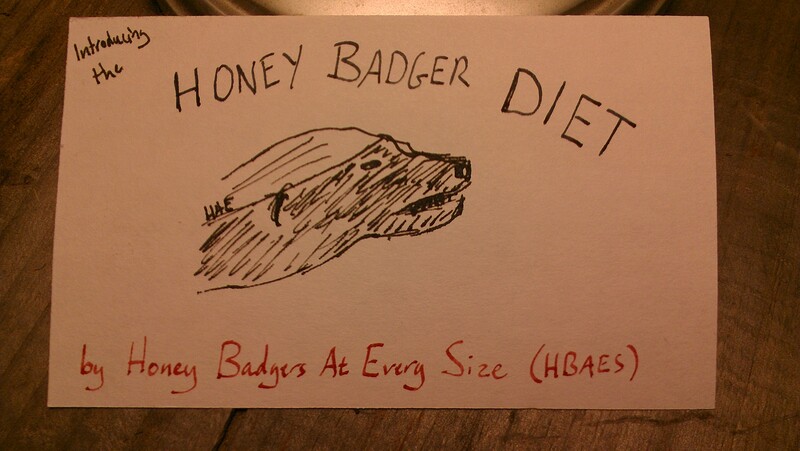 The Honey Badger Diet is loosely based on some things Linda Bacon wrote, especially this. 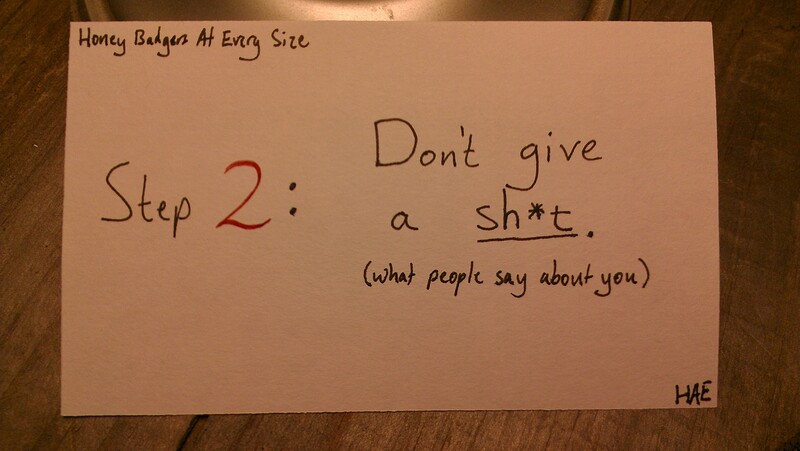 I hope they’ll forgive me for framing some HAES concepts using my honey badger fixation. Be kind to yourself, and to your honey badgers. If people fat-shame you or police your body, emulate the honey badgers and try not to give a sh*t. Ask to see their evidence. 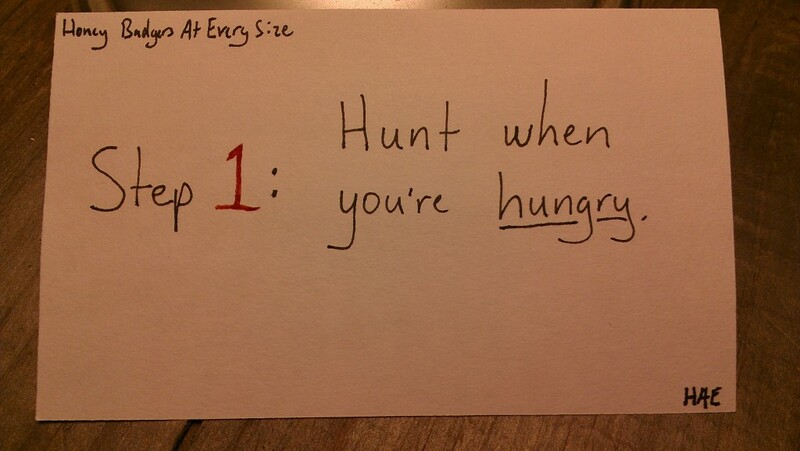 And then continue hunting when you’re hungry and not giving a sh*t. Enjoy! Pathologizing language, where honey badgers illustrate how to be respectful about the problems others face. The Honey Badger Empathy Survey, where we assess the degree to which honey badgers in the wild display empathy. T-Rex and Honey Badger Drawings, where Mrs Honey Badger goes to see a marriage and family therapist.